About two and a half years ago, I had a nice stretch of good health. I still had a few bad days every month, but I had mostly mediocre days and even a handful of good days every months. D was sleeping well and taking two decently long naps a day, so I took advantage of the situation and became best buds with Jillian and my treadmill. I ended up losing almost 40 pounds and looked pretty good for my 20 year reunion. But then I hit my head again, and between the insane headaches, vertigo, blurry vision and overwhelming fatigue, unsupervised exercise was not allowed, let alone possible. Sixteen months later, I'm still dealing with all of the above symptoms, but I have the okay to exercise again. Except for the issue of a little one not sleeping as much. And the fact that a measly 20 minute run makes my head explode and render me worthless for the next 24 hours. Last week, I expressed my frustration to my neuro about gaining almost all the weight back. And the lack of time I had to exercise I had during the day, and the lack of energy I had when Niels was home to watch D. My son, D, was with me, as usual, quietly playing with his flashcards. Dr. H looked at my son and said, "You will have plenty of time to exercise when he starts school. Spend your limited energy enjoying this time because you'll never get it back. Do what you can to involve D in physical activities, but don't worry what the scale says for now." Our scale doesn't have nearly that much room, so I had to improvise. I realize the irony of leaving out the word "important," but it works for me. 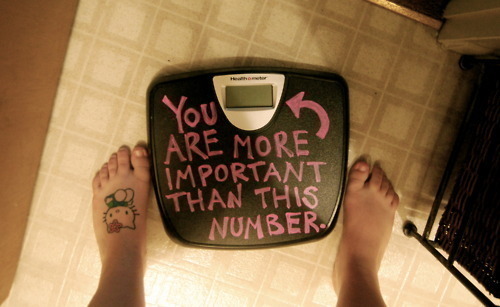 I am more than the number on my scale. I am Niel's wife: as is, no returns or exchanges (that's our marriage motto). I am D's mommy, and I am his world. I am a child of God. Beyond that my relationships are challenged by my ability to be consistent, but they are important to me nonetheless. I guarantee that at the end of my life, those forty pounds aren't going to matter in the least. What is going to matter is that I have made the most of my days. So, that's what I'm going to do. Back to the scale. Here's what I did. First, I figured out how many of each letter I needed. Originally, I was going to use all the same stickers, so I made a little chart with the full phrase, "You are not this number." Then I looked through my sticker letters to see what I wanted to use. Our house colors have a lot of purple and green, so that was an easy decision. Next, I cleaned off my scale. The poor thing is probably ten years old by now and has seen a lot of action, but I'm not buying a new one. I started with the word "more" because it was central, and I've found that when I start with the center of a word or phrase, my projects turns out better. Another trick is to put part of the sticker on a sheet of paper or plastic to line them up straight. It's a lot easier to move the whole word around for placement. The purple letters weren't very sticky so I got some help. Fingers crossed that it dries clear. I had to think about how to place the last part of the phrase, (and now that I look at it, I wish I would have added the word "important" as a single line under more. I may have to fix that eventually). I stuck the words "than this number" on the plastic sleeve so I could really see how it would look. I adjusted quite a bit, which was easy with the plastic trick. Once I found the right place, I smoothed down the top of the letters, and then gentle removed the plastic while smoothing down the last bit of the letters on the scale. Voila! 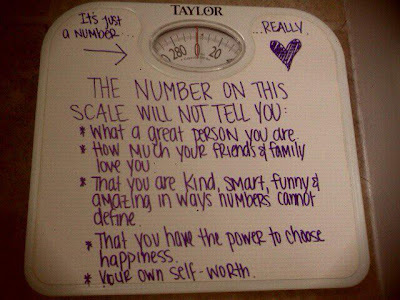 Now I can have happier thoughts when I weigh myself each morning. Note: Now that we're moved in, we're starting to think about what to do with our blog. In this next phase, I see a lot of posts on projects, organization and good ol' reduce, reuse, and recycling. On the technical side, Niels will likely add some review of our vendors and choices, and write up some "if we had to do it again" posts. As we transition, we're starting to be more active about sharing our blog, which means joining linky parties and other cross promotions. I submitted this project to HappyGoLuckBlog's The Pinterest Project and Pondered, Primed and Perfected's Beating the Blog Bulge Party. Great idea!! Thanks for sharing! 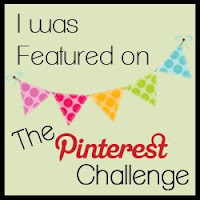 We are featuring you tonight at The Pinterest Challenge's Top Ten. I have been contemplating taking a sledgehammer to my scale - think I will do this instead!! Thank you for the positive, inspiring post! lol...I certainly have those days, too. This is a great post. I have to get time to read some of your popular posts. They look very interesting! I am visiting from Blog Bulge. I am following your! Welcome to our humble home on the web. Hope you enjoy poking around. What a fabulous and inspiring idea. Thanks for sharing over at the Blog Bulge link party! Have a great weekend!